Far be it from me to question all the rampant vacuum tubery that's been going on in the past few weeks, but companies keep making 'em for a reason. Vincent Audio is the latest such company to subscribe to the theory that "vacuum tubes = sales" and have released a headphone amplifier employing the outdated technology. Sure, they expect you to throw down nearly $800 to amplify headphones, but at least the company promises "audio bliss." Audio bliss... Hmm, I wonder if that's anything like being told that your gal's pregnancy tests came back negative? There's two headphone jacks on the front for some dual-amplifying action. 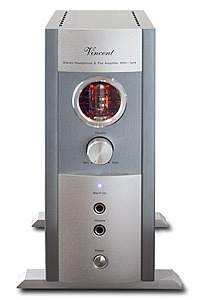 Honestly, though, if you need an $800 headphone amp powered by vacuum tubes, you may need to reconsider your priorities.